This portrait by in the Palais des Beaux Arts in Lille has become one of the standard and most widespread images of Robespierre on the internet, yet very little is really known about it. It was first identified as Robespierre only in 1928, in an article by Fernand Beaucamp. It is recorded as having been purchased by the musée des Beaux-Arts in Lille in 1863, but all the relevant documentation was destroyed in a fire at the Hôtel de Ville in 1916. The picture can be securely recognised on stylistic grounds as the work of Boilly; it is the identity of the sitter which is more speculative. The first catalogue of Boilly's work, published by Henry Harrisse in 1908, listed the painting as an anonymous "Man seated before a bureau". 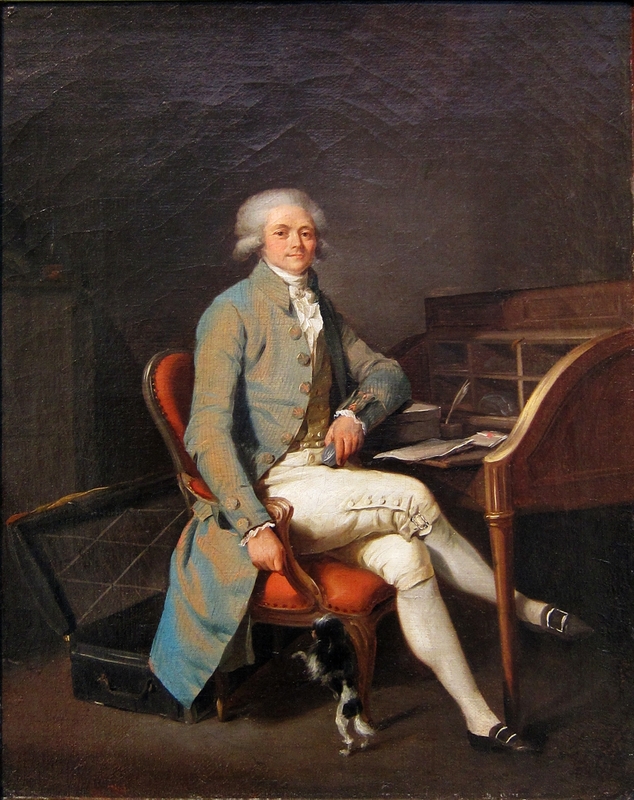 Fernand Beaucamp's case rests only on the simple, though reasonable, grounds that the person depicted looks like Robespierre and suggests his dress. The accessories imply a man of letters, but do not really personalise the sitter. As Beaucamp himself admitted the bare interior does not correspond to Robespierre's lodgings at the Duplays; in particular the roll-top desk is quite different from the square table in the watercolour drawing published by Buffenoir. (The curious suitcase behind the chair could perhaps be construed as Robespierre's "malle du départ d'Arras", though it isn't really a "trunk".). 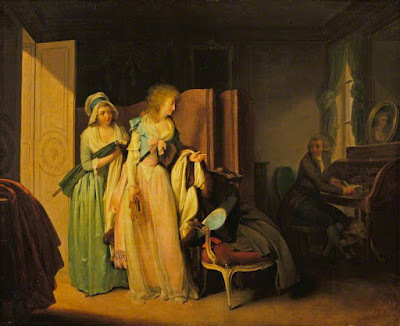 Most likely the sparse items of furniture are studio props; other Boilly pictures have very similar chairs and desks (see below). Equally Boilly often populated his pictures with lapdogs. Robespierre (2012) Plate 4. "The young Louis-Léopold Boilly (1761-1845) painted this portrait while studying under Dominique Doncre in Arras after 1778. The young barrister may be flushed with recent success in the case of the lightning conductor. Maximilien always enjoyed the companionship offered by dogs"
Liberty or death: the French Revolution (2016) Colour plate 3. "The young Louis-Léopold Boilly(b. 1761) painted this portrait of the barrister Maximilien Robespierre in 1783 while studying in Arras. Robespierre, aged twenty-five, seems to be flushed with his first major court success. He always enjoyed the companionship offered by dogs." This scenario fits in well with McPhee's emphasis on Robespierre as an up-and-coming young lawyer, but I still worry about the plushness of the clothing, given Robespierre's modest circumstances and the well-attested meagreness of his youthful wardrobe. Fernand Beaucamp, "Un portrait inconnu de Robespierre au musée de Lille", Revue du Nord (Feb 1928) p.21-34. 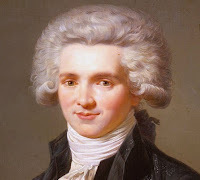 Is there a face of Robespierre?